An elderly woman was hit by a sport utility vehicle and critically injured yesterday as she crossed a busy Honolulu intersection, adding another victim to the long list of older residents who have been run over this year. The latest accident came on the same day that a state House committee approved pedestrian safety studies. State lawmakers have introduced or are planning to introduce bills to address the problem. At about 9:45 a.m. a blue 2003 Kia Sorento driven by a 63-year-old woman was traveling north on Piikoi Street in the left-turn lane. 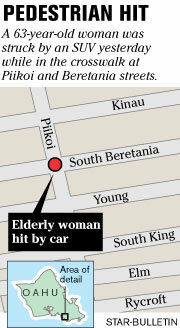 The driver made a left turn onto Beretania Street, where a 64-year-old woman was heading north across the street. The woman was in a crosswalk, and both the driver and pedestrian had the green light. The woman was initially transported to the Queen's Medical Center in serious condition but was soon downgraded to critical condition. In a situation where both crosswalk and traffic signals give the go-ahead, "the pedestrian in the crosswalk has the right of way," said Sgt. Daniel Kaholokula, of the police Vehicular Homicide Section. "The responsibility lies with both parties, but more so the driver because of the vehicle they are in." Beretania Street between Piikoi and Keeaumoku streets was blocked off all morning yesterday as traffic investigators were at the scene. 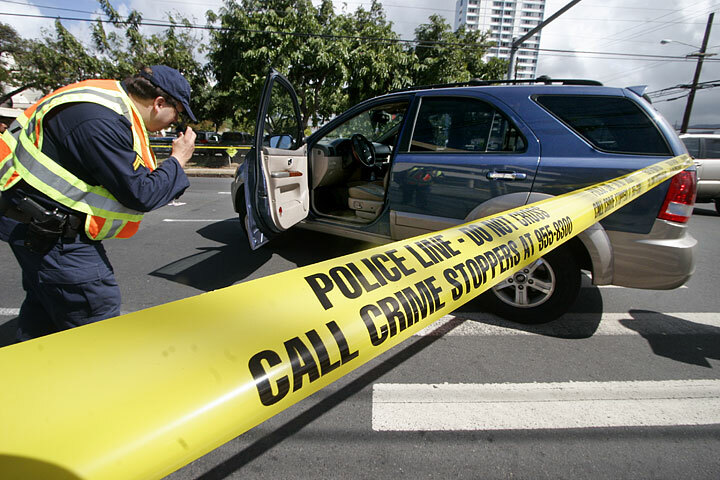 Half of the 14 Honolulu traffic fatalities this year have been pedestrians, all of them 59 years old and above. The fatalities have prompted aggressive outreach campaigns by city and state officials. A number of solutions are being sought, including two separate bills that call for studies on intersections. 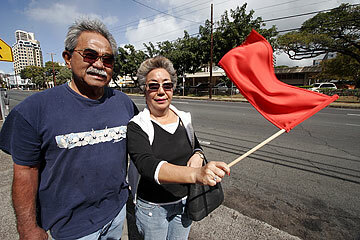 The Hawaii chapter of the American Association of Retired Persons already has conducted a study of busy intersections. Both bills, which call for the studies on city and state levels, passed in the state House Finance Committee yesterday and will be up for a House vote in the coming weeks. Some elderly pedestrians are taking matters into their own hands. They have started using flags to make it easier for drivers to see them. 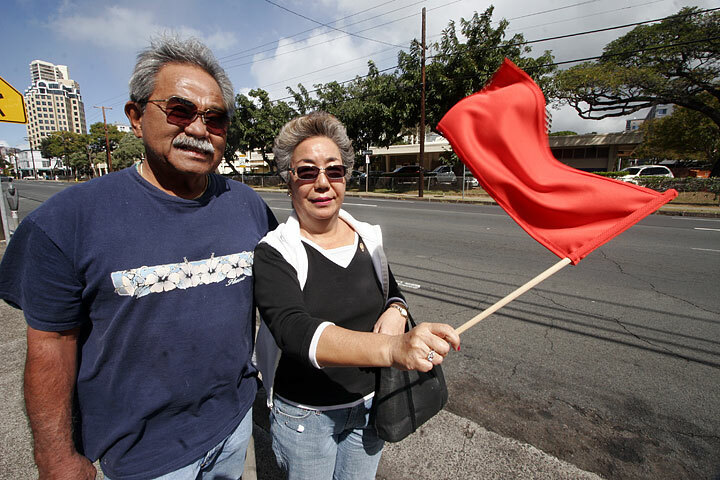 Fumiko Nakasone, 64, said that because of the increase in pedestrian deaths, she recently made a bright red flag that she carries around in her purse. She waves it as she crosses the street. Her husband, Warren Nakasone, said he hopes to raise awareness about the solution. State Rep. Marilyn Lee (D, Mililani) introduced a bill last year to begin a pilot project to place bins with flags in them at several intersections. Critics called the idea "silly," despite success in Japan and 13 other states, she said. Concerns were also raised on how to decide at which intersections to install them, and how to protect them from thieves or vandals. The bill eventually failed, but Lee said she hopes to reintroduce it next year. She said the bill could use results from the proposed intersection studies now being discussed. "Since then I've gotten a lot of positive feedback," Lee said yesterday. "I don't think it will be very expensive, and I think anything that's going to keep people from dying every day will be worth it." Lee said one option is having private companies donate bins and flags. Warren Nakasone liked that idea, saying public-private partnerships can fund the project since awareness on the issue is rising. Yesterday, Hawaiian Electric Co. launched its own awareness program, placing bright yellow and black bumper stickers on all 525 of its vehicles. "Companies can donate the bins and have their logos on it," Warren said. "With flags you can draw attention to yourself, and drivers will be careful. It works in Japan, it can work here." Another woman, 71-year-old Momoko Ginoza of Liliha, made her own bright green flag after her close friend, 78-year-old Kakaako resident Tsuruko Shimabukuro, died in 2005 when she was hit by a car. Ginoza and Nakasone both got the idea from Japan, where they used to live. Ginoza carries her flag in her purse or on the dashboard when she drives. 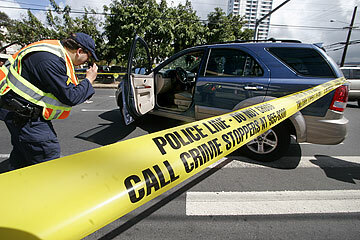 "Hawaii is so dangerous for drivers and pedestrians," Ginoza said. "It would really make me happy if everybody had a flag. It's so easy to carry. Nobody should waste their life."